Chalet Kaila benefits from an outstanding location just 50m from the Super-Morzine bubble, 500m to the Pleney piste and nursery slopes and a minute's walk from the centre of Morzine. Ski hire in Chalet Kaila is provided by Doorstep Skis who offer and in chalet fit service. Could we find a chalet even closer to the lifts in the centre of Morzine? We weren't sure until our long-standing friend, Jean-Marc, built us a luxury chalet right next to the Super-Morzine lift (well, 57 steps away to be exact). Chalet Kaila is our secret hideaway, balanced on a cliff, bang in the centre of Morzine and boasting an exquisite and unexpected panorama of the local summits. It comes with all the luxuries you would expect, like an outdoor hot tub, sauna and flat screens in all the rooms. Smart contemporary living, nice sized bedrooms with plenty of cupboard space (oh, so important), oversized hot water tanks and a location to tell your friends about. 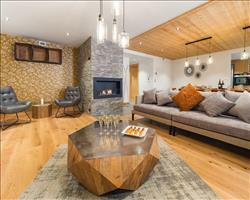 We are pretty pleased with this - and we're confident there's no other luxury chalet in Morzine quite like this one. Chalet Kaila sleeps 8 to 10 people and is ideal for a family or group thanks to it's spacious Family Suite on the Ground Floor. The suite has a double room with shared terrace and outdoor hot tub, en suite bath, hand basin and separate WC. There is also an adjoining bunk room with the beds charged at half the adult price. 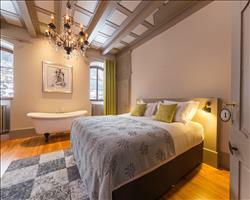 There is a Double room which shares the terrace with the suite and two Twin rooms on the Second floor. (Ground floor) - Family Suite - Double with shared terrace and outdoor hot tub, en suite bath, hand basin and separate WC. Bunk room (50% discount) with space for a cot. (The Double room is accessed through the bunk room). (Ground floor) - Double with shared terrace and outdoor hot tub, en suite shower, hand basin and WC. (2nd floor) - Twin with balcony, en suite bath, hand basin and separate WC. (2nd floor) - Twin with balcony, en suite bath, hand basin and separate WC. Space for a cot. We update Chalet Kaila's details often, but facilities do change. e.g. some extras listed by the supplier as "free" or included might only be for the first time you use them, or for one time per party, then charged for further use. If any specific feature is essential to your holiday, make sure you ask us to confirm the details of it before you book your holiday. 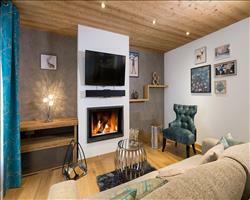 This package holiday to Chalet Kaila in Morzine, France departs Sunday 15th December 2019, for a 7 night stay on a "catered chalet" board basis. A local tourist tax (Taxe de Sejour or Kurtaxe) is levied by many councils in European ski resorts. It varies by standard and type of accommodation and is age dependent, so not everyone is charged. It's not included in the basic price of your holiday and is usually paid locally. For reference, the average charged in winter 15/16 was between 50p and £2 per person, per night. Portes du Soleil (Adult 6 day): €225. Ask for a quote when booking Chalet Kaila. 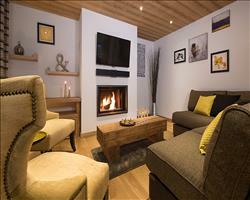 Little Lumi Morzine France, Gatwick to Geneva 15th December. "A wonderful skiing holiday despite a couple of days of poor conditions." "Fantastic food and great accommodation"
We had a lovely week in the Chalet. Tom and Harry were really helpful and fantastic hosts. The food was particularly amazing. Thanks for a lovely week. 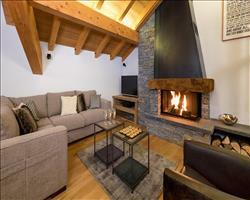 "Wonderful chalet, hosts and snow!"